Friends on s/v Navigo have decided to head south towards Manzanillo, so sadly, they left us behind to explore Jaltemba and the Banderas Bay area by ourselves. 😦 We hope to catch up to them before I head home. 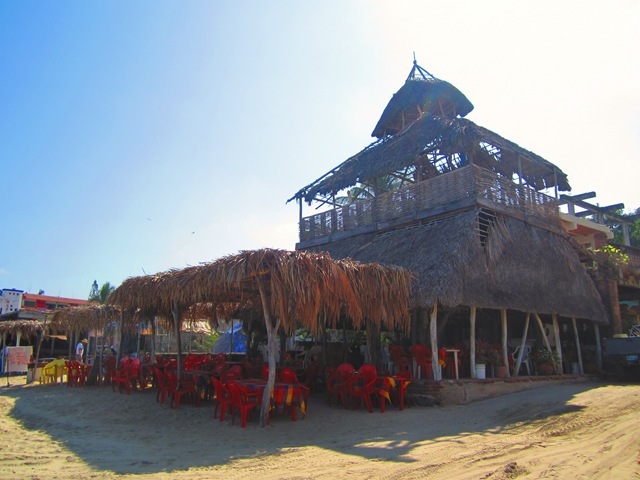 I assumed, after our Chacala beach time that we wouldn’t need to go to the next beach town in the next anchorage. But the Capt’ insisted that he wanted to check it out. 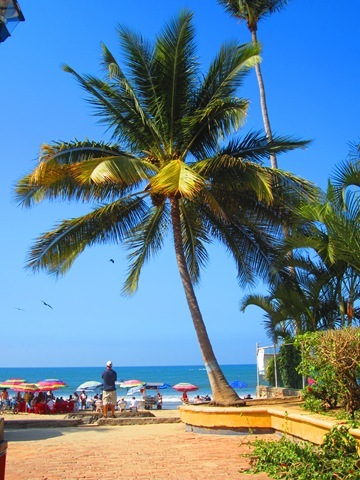 The Bay of Jaltemba consists of three small towns; we anchored just off the beach of Rincon de Guayabitos. 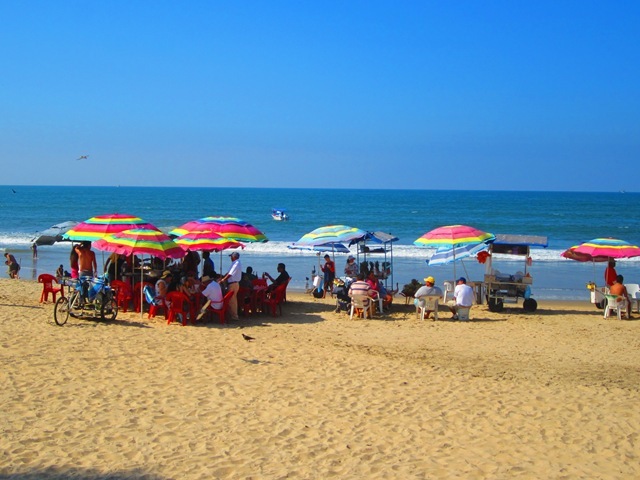 While it was a similar beach town to Chacala, this one is much more oriented towards tourists (Mexican and abroad). 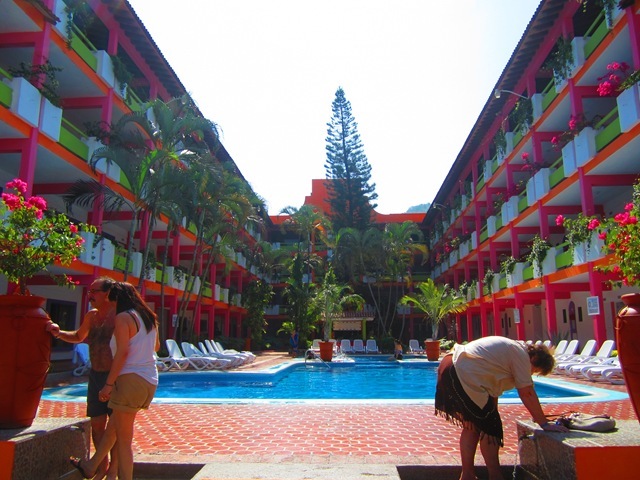 There are many resorts and hotels and palapa restaurants with Feliz Horas. But it’s a lovely beach and definitely worth a stop. Beach palapa (top) and the colorful Cocos resort (bottom). 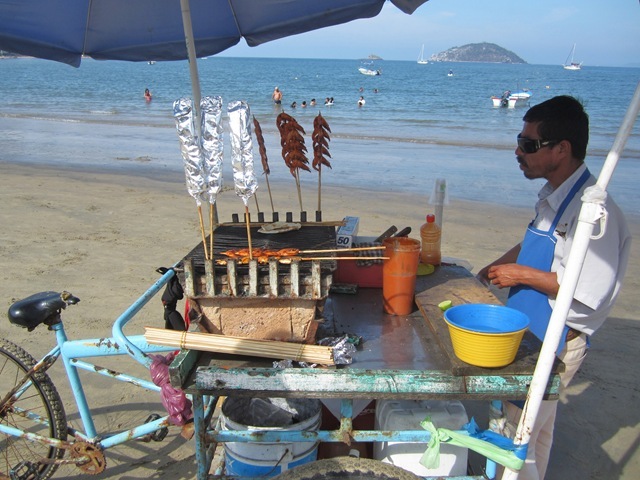 We also enjoyed the local delicacy; BBQ-ed shrimp and fish kabobs on the beach. We also had the chance to drop our laundry off at the local lavandaria. They were only charging $13 pesos per kilo and we were hurting for some clean laundry and the bucket method was taking too long and I refuse to do the sheets and towels in the bucket because they’re too hard to wring/dry. Anyway, we piled EVERYTHING into a laundry bag in the morning and by the end of the day and only $150 pesos later,(less than $12 USD) everything was clean, dried and folded up nicely. BBQed fish kabobs on the beach (top), beautiful palm in a plaza beside the beach (middle), and the colorful beach scene in Guayabitos (bottom).